There are 21 Assisted Living Facilities in the Layton area, with 3 in Layton and 18 nearby. The average cost of assisted living in Layton is $2,716 per month. This is lower than the national median of $3,346. Cheaper nearby regions include Kaysville with an average starting cost of $2,150. To help you with your search, browse the 181 reviews below for assisted living facilities in Layton. On average, consumers rate assisted living in Layton 4.5 out of 5 stars. Caring.com has helped thousands of families find high-quality senior care. To speak with one of our Family Advisors about assisted living options and costs in Layton, call (855) 863-8283. With its close proximity to the Salt Lake City metropolitan area and convenient access to shopping and outdoor activities, Layton offers residents plenty to see and do. For the approximate 6,300 seniors that call Layton home, that convenience also includes the opportunity to live in one of the 24 assisted living facilities in and around the city. As in the rest of Utah, those assisted living facilities, or ALFs, are overseen by the Utah Department of Health, which takes care of licensing and monitors ongoing operations. Seniors can expect to save on health costs, utilities and transportation in Layton, but the city’s cost of living still sits above the national average due mostly to soaring housing costs. Summers in Layton are sunny and hot, with July highs topping out at 91 degrees Fahrenheit, but winters see temperatures plummet to the low 20s and snow piles up quickly. For active seniors, these conditions could limit excursions, but others will appreciate the lack of rain and sub-zero temps. There are plenty of opportunities to enjoy arts and culture in Layton. From Free Friday Film Nights to concerts at the Ed Kenley Amphitheater, the city offers locals a chance to enjoy a wide range of regional and internationally acclaimed artists. Safety in Layton is a mixed bag. While violent crime is 6 out of 100, less than the national average of 31.1, property crime in Layton ranks higher compared to similar statistics from across the United States. The Layton area is home to world-class medical facilities, including Intermountain Layton Hospital and Davis Hospital and Medical Center, in the event of medical emergencies or illness. Layton has an array of community resources for seniors, including the Davis County Health Department’s Senior Services, which offers information on long-term care, access to activities, health care information, and referrals, as well as at least two senior centers. Assisted Living costs in Layton start around $2,716 per month on average, while the nationwide average cost of assisted living is $4,000 per month, according to the latest figures from Genworth’s Cost of Care Survey. It’s important to note that assisted living rates in Layton and the surrounding suburbs can vary widely based on factors such as location, the level of care needed, apartment size and the types of amenities offered at each community. 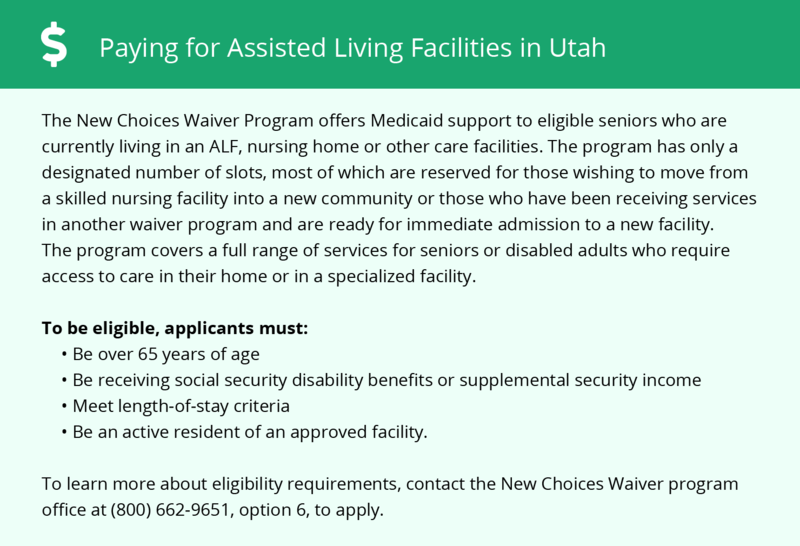 Low-income seniors in Layton interested in assisted living may be eligible for financial help courtesy of two Medicaid-affiliated initiatives: the Utah Home and Community Based Services (HCBS) Waiver and the New Choices Waiver. 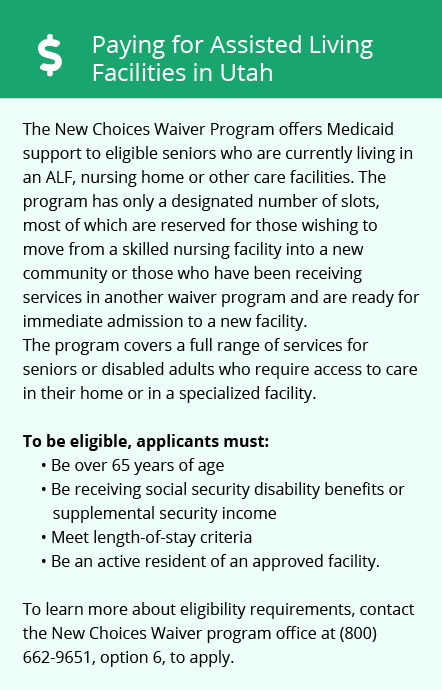 Both programs support seniors’ freedom of choice, but while the HCBS Waiver mostly serves seniors launching their long-term care search for the first time, the New Choices Waiver helps those already in institutionalized care transition back home or locate appropriate assisted living placement. Learn more about these programs, plus who’s eligible, on our Assisted Living in Utah page. For more information about different ways to finance assisted living, visit our Assisted Living in Utah page. Layton and the surrounding area are home to numerous government agencies and non-profit organizations offering help for seniors searching for or currently residing in an assisted living community. These organizations can also provide assistance in a number of other eldercare services such as geriatric care management, elder law advice, estate planning, finding home care and health and wellness programs. To see a list of free assisted living resources in Layton, please visit our Assisted Living in Utah page. Layton-area assisted living communities must adhere to the comprehensive set of state laws and regulations that all assisted living communities in Utah are required to follow. Visit our Assisted Living in Utah page for more information about these laws.